Banksy is a pseudonymous England-based graffiti artist, political activist, film director, and painter. Banksy's true identity is still unknown. 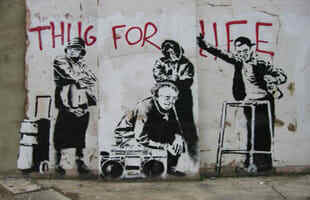 Banksy is the artist of the underworld that gets a ton of respect, we just wish we knew what he looked like. Is Banksy Actually Massive Attack’s Robert Del Naja?